Here is a great feature we have been waiting for a year. Google Calendar on the web now supports Reminders, a feature which was initially available only in the Calendar app for iOS and Android. 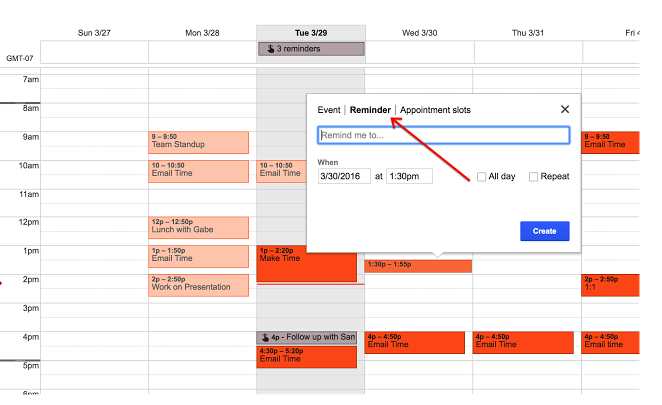 You can now create reminders on your calendar and receive notifications about their due time. All the reminders you create on the web will automatically sync to your Google Calendar apps on both Android and iOS so you can still view and edit them on the go. Additionally, your reminders remain private and only you can access and view them even when you share your calendar with others. And if you have already created reminders in other apps such Keep or Inbox, these will also be displayed in your Calendar on the web. To create a reminder on your Calendar, ‘tap on a time in the calendar grid and select reminder’ as shown in the screenshot above. To mark down a reminder, simply click on the reminder and select ‘Mark as done’. Check out Calendar Help centre to learn more.